TheJournal.ie has drafted its own indepth report card on what Fine Gael and Labour did, and didn’t, do in 20 areas of policy over the past 12 months. 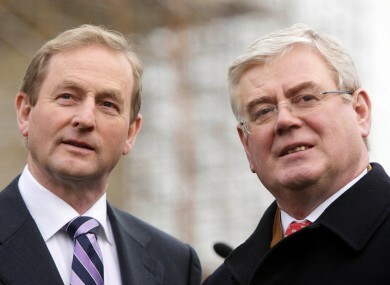 Hopeful: The Taoiseach and Tánaiste at Leinster House last December. THIS WEEK, TAOISEACH Enda Kenny and Tánaiste Eamon Gilmore reported on their coalition’s progress in government over the last 12 months. The full report outlines its “commitments delivered” since it stepped into power on this day last year. … And what they have actually delivered – and not delivered – since the 31st Dáil first sat on 9 March 2011. Reporting by Christine Bohan, Gavan Reilly, Susan Ryan, Hugh O’Connell, Jennifer Wade, Michael Freeman, Sinéad O’Carroll, Aoife Barry. Is there another issue, not listed here, where you think the Government has made real progress – or needs to? Tell us in the comments section below. Email “How has the Government REALLY done in its first year? This is how.”. Feedback on “How has the Government REALLY done in its first year? This is how.”.